I LOVE arts and crafts. I love drawing, painting, coloring, cutting, gluing, using clay, paper, paints, glitter, craft sticks, and other arts and crafts materials. 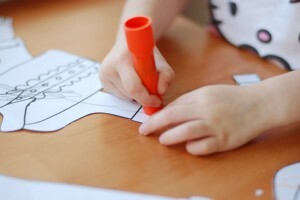 Have you ever noticed that arts and crafts activities are a staple part of the curriculum in early childhood education? 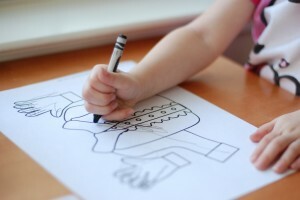 I challenge you to find a preschool that doesn’t incorporate arts and crafts in their lessons. Not only are arts and crafts activities vital for the development of fine motor skills and visual processing skills, but they also are an amazing way to stimulate and expand receptive and expressive language skills! I do crafts all the time with my daughter (and have blogged about a few of them here) and use crafts in my therapy sessions often. Social/pragmatic skills like requesting, protesting, informing, eye contact, turn taking, etc. Use the strategy of self talk as you and your child (or student) are doing the craft. This is when you (the adult) talks about what you are seeing, hearing or doing. For example, “I am gluing the red paper to the yellow paper” or “I am cutting the paper”. Be sure to slow down, emphasize and repeat new vocabulary words. Repetition is the key to learning new words! Model, Model, Model! Model good speech and language skills during your crafts. Model the language you want your child to use. 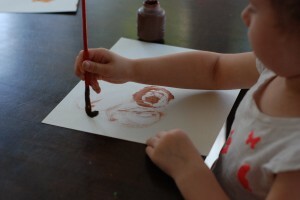 I love art and craft too and would also love it if you linked some of your excellent posts at the Today at Play year long Link Up. Georgie, thanks so much for stopping by, I will for sure link up with you! I am having difficulty signing up for your newsletter.